For this vacation, we booked our flights on SWA several months in advance, and took advantage of four $100 vouchers on SWA that we received the previous year for flight delays. Our itinerary was to fly to Phoenix on Saturday, Nov. 17 and return to Houston on Monday, Nov. 26. Our SWA flight into Phoenix arrived in early afternoon. We rode the shuttle bus to the rental car facility, where the kids talked me into to upgrading our rental car reservation for a standard SUV to a larger SUV so that our overflow of luggage could all fit into the back end instead of having one or two leftover bags in the middle of the back seat. We headed north out of Phoenix on I-17 and had lots of traffic congestion around the town of Anthem. At Camp Verde we exited I-17 and headed to west Sedona by way of Cottonwood. 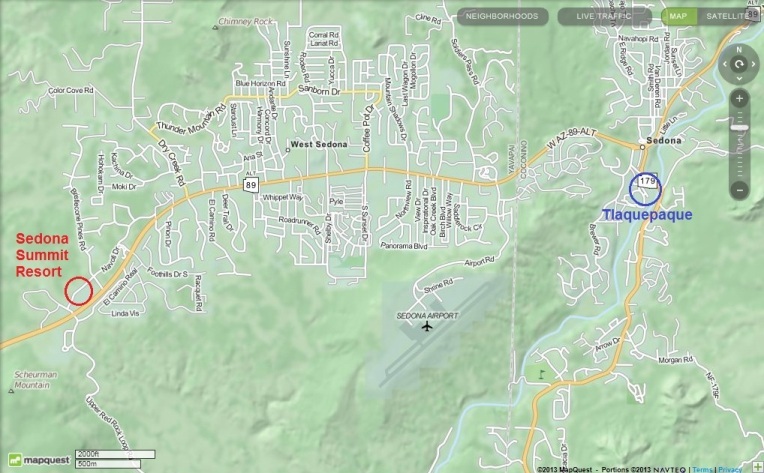 That route is a faster ride than going through Village of Oak Creek on Hwy 179. 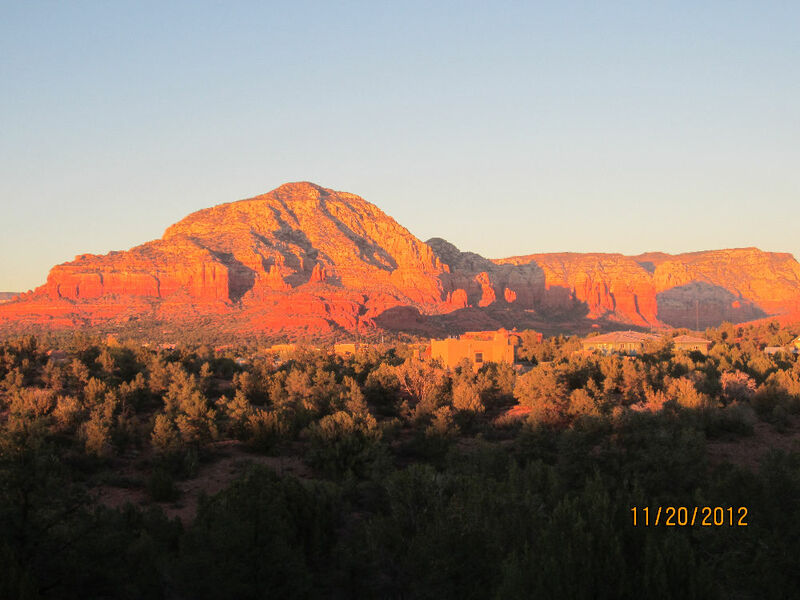 Upon arrival in Sedona, we checked into the Sedona Summit resort and unloaded luggage in preparation of a week of rest and relaxation and sight seeing and goofing off with friends and relatives. 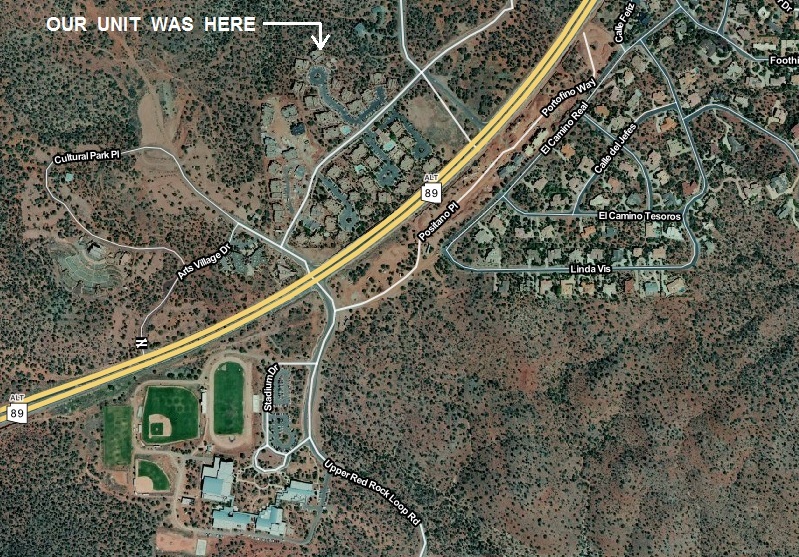 Location of our unit at the Resort. During the week we often got together for meals and activities with Greg, Pam and Karen. Unfortunately, Dana couldn't make this trip. Cousin George Hill and his wife Kathy also came to visit Sedona and stayed in the unit directly above us. 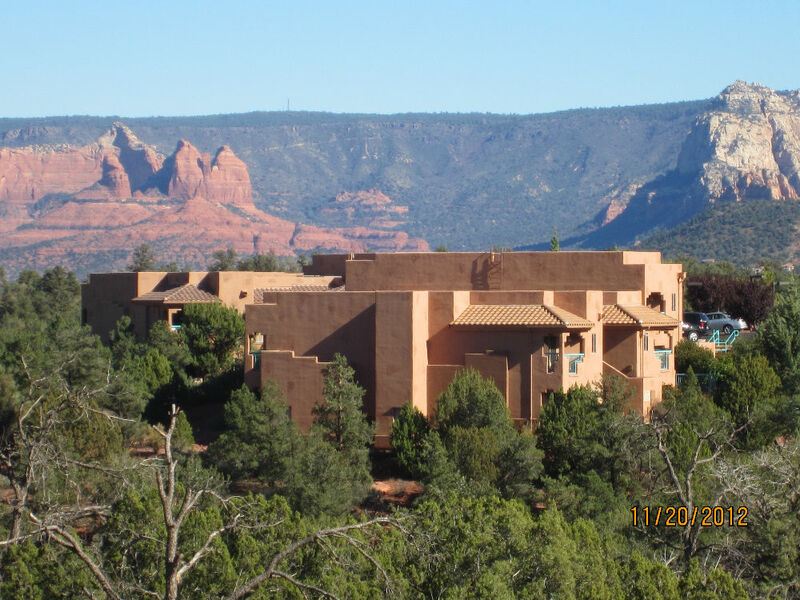 Our friends Randy and Kathy Kaufman from Payson also came to Sedona, and stayed in a unit over near where Greg and Pam stayed, and which is closer to the resort lobby and fitness center. On Sunday, Katie and I drove down to Safeway and purchased a carload of groceries. That purchase earned us enough points to get a free Thanksgiving turkey. Katie picked out a 20 lb. turkey, which we baked later in the week. Tom started cooking the turkey on Tuesday morning and by afternoon it was ready to eat. The whole gang came over with side dishes, salads, desserts, etc. and we all enjoyed an early Thanksgiving feast and the camaraderie of our friends and relatives at the resort. We had plenty of left overs to have another big feast on Wednesday. Whenever we were not cooking and eating at the resort, we would enjoy going out to eat. Some of the restaurants at which we dined included The Hideaway, Red Planet Diner, Coffee Pot Restaurant and T-Carls. During the week Greg and Tom had opportunity to play some tennis at the city park courts and later at the high school courts. Of course, Greg won, but many of the games were quite competitive. We also did some hiking and general sight seeing. Katie and Jeremy and cousin Karen also took in a movie at the local cinema next door to Art-Mart. On Friday, Tom got the flu and stayed in bed sleeping all day. 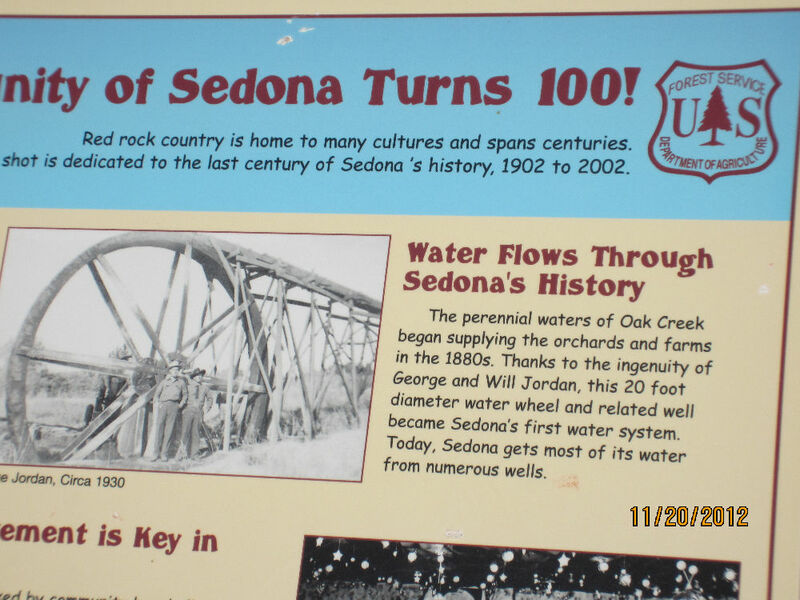 Meanwhile on Friday, Elizabeth and the kids did some hiking around the Midgely Bridge and sightseeing in Oak Creek Canyon. 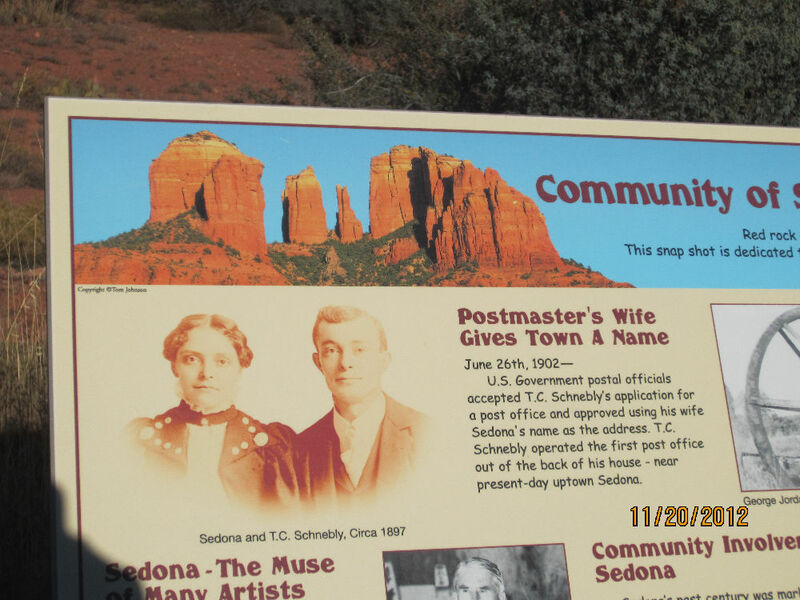 We checked out of the resort on Saturday and drove to Prescott. We spent the rest of Saturday and Sunday and Monday morning with George and Kathy Hill in Prescott. On Monday we packed up our stuff and drove to Phoenix for the flight back to Texas. Morning view from the patio at our unit. Evening view of Thunder Mountain looking north from the resort. Diagram of landscape from Mingus Mountain to Cockscomb. 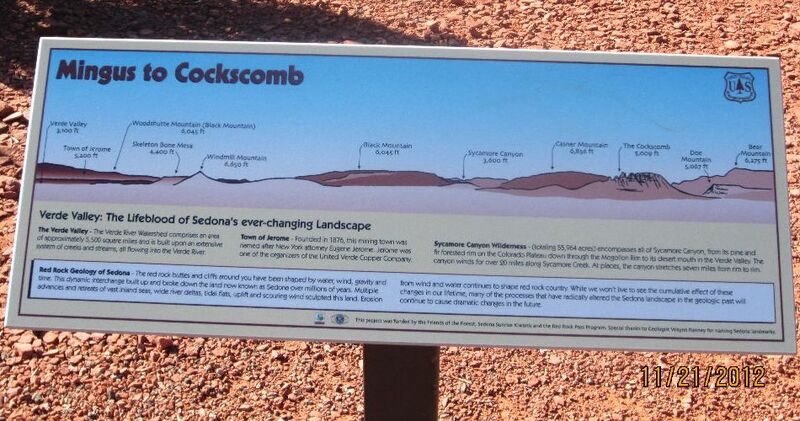 Diagram of landscape from Cockscomb to Sedona. 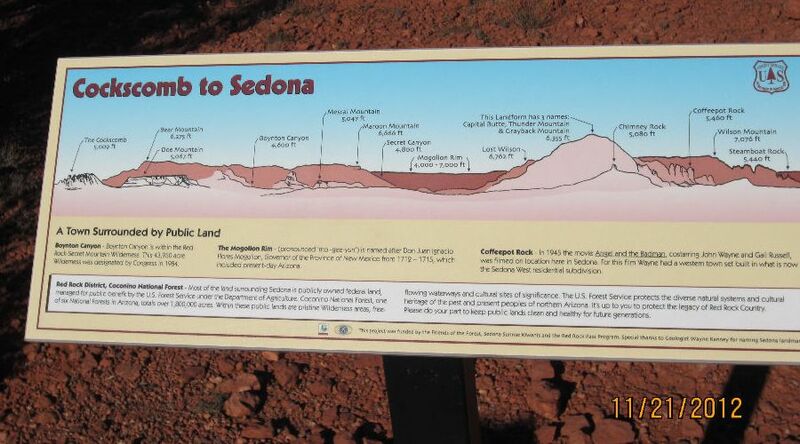 Sedona was named after the wife of early settler T.C. Schnebly. 20 foot diameter water wheel provided irrigation to local orchards. were grouped into three categories, which are linked below. 1. 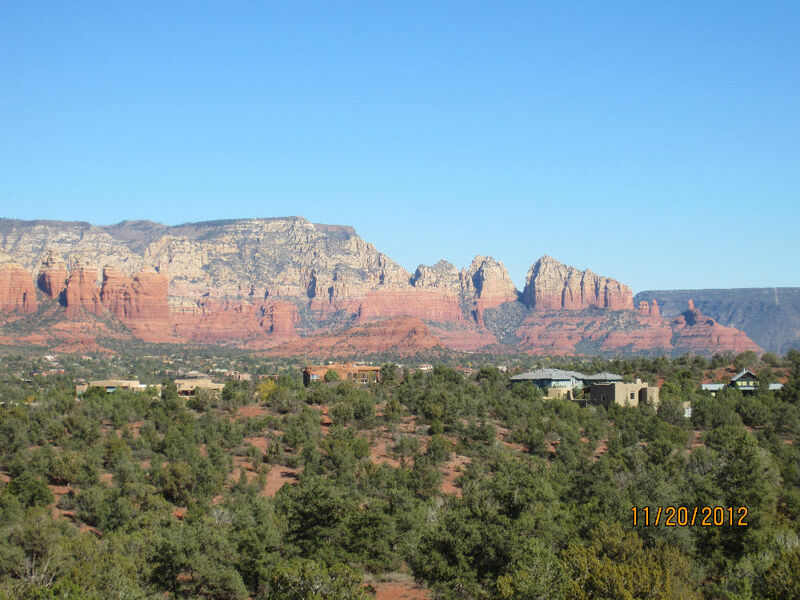 Family, friends, relatives and People in Sedona. 2. Manmade Scenery, Tlaquepaque, Midgely Bridge, etc. 3. Nature Scenery, rocks, mountains, Oak Creek, etc.